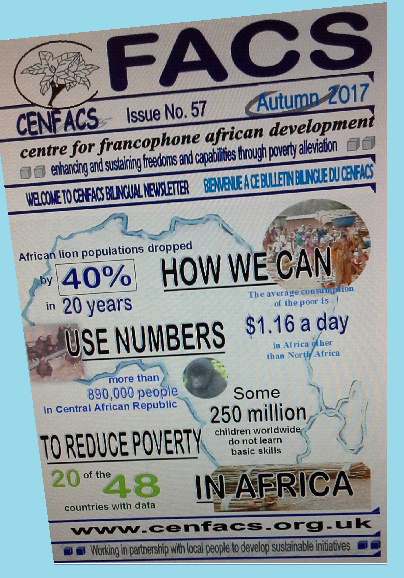 An abstract about the 57th issue of FACS, CENFACS’ bilingual newsletter was already given last week. The key highlights make the contents of the issue; highlights which are as follows. There are many ways in which lives can be saved. Lives can be saved by giving humanitarian rescue to those threatened by environmental disasters or catastrophes (like Hurricane IRMA in the Americas and the Pacific), by evacuating the victims of armed conflicts of armed conflicts and wars, by treating those who are at risk of contaminating by epidemics or diseases. But lives can also be saved by getting the numbers we need of those in need. These numbers could be the size of their population expressed in numbers and any intervention or project to be carried out expressed in numbers. The more we know in terms of numerical data and indicators about those who need their life to be saved, the more support can be done, the better we can measure the gap between saved lives and unsaved ones. In other words, when lives are not counted and numbered it is difficult to meet the saving needs for all. Not everybody likes numbers. Some people prefer words to express themselves than using numbers. However, the reality of life is that we cannot avoid numbers. We use numbers every day and time as well as all occasions whether to check time, to plan our daily journey, to do shopping and banking etc. We may not like it but we need or are forced to use, speak and understand about things through numbers. This applies too to poverty reduction. We use numbers to measure and speak about poverty and its reduction. Sometimes numbers are staggering. We heard about 5,000 NUMBERS OF PEOPLE are FORCIBLY DISPLAYED PERSONS; 7,000 PEOPLE are the VICTIMS OF NATURAL DISASTERS in the Pacific; 1,000 GIRLS have been EDUCATED etc. We may not like it but we may have to learn to like or at least use the numbers about poverty and poverty reduction. Il y a deux manières d’exprimer les données et informations relatives à la réduction de la pauvreté et au développement: valeurs numériques et données qualitatives. Ces deux méthodes ont des avantages et des inconvénients. Dans le cadre de cet article, nous nous intéresserons seulement aux valeurs numériques. Cela bien entendu malgré les critiques à l’égard de la présentation chiffrée de l’information. Quand on écoute ou voit la présentation des chiffres ou données numériques relatifs à la pauvreté, à la faim, aux épidémies, à la détérioration de l’environnement etc. en Afrique, cela fait raisonner dans nos esprits sur le décalage à combler ou l’effort à accomplir sur la différence entre la vie qu’on considère pauvre et celle qui n’est pas pauvre. Les chiffres ou valeurs numériques sur la pauvreté et le développement durable nous permettent soit de comprendre soit de questionner les situations et conditions de pauvreté. Brièvement, les chiffres ou numériques peuvent apporter les contributions suivantes aux situations et conditions de pauvreté: faire l’état des lieux de la pauvreté, motiver à réduire la pauvreté, mesurer l’effort intellectuel, motiver à réduire la pauvreté, apporter l’autorité, soutenir les mots, comparer, planifier, projeter les situations de réduction de la pauvreté etc. Les projets générateurs de revenu par le biais de la vente des biens et services, formulés en mots et en chiffres, ont la chance de réussir quand les nombres ou chiffres présentés sont sensés et les additions sont équilibrées. C’est le cas par exemple ceux intégrant des données numériques présentées au sein des états financiers (tels que les comptes de marge brute d’autofinancement, le bilan, les comptes de revenus et de dépenses, l’analyse de coûts et bénéfices etc.). Cela sans oublier les autres numériques tels que les taux d’intérêt, l’indice de prix ou le taux d’inflation. Ces données numériques ont besoin de transmettre ou traduire la réalité de la pauvreté pour les projets dont elles font partie aient une vraie chance d’être financées. Cela étant la présentation chiffrée ne suffit pas, il faut qu’il y ait une cohérence et une logique entre les expressions numériques et les expressions litéraires. Autrement dit, il faut il y ait une relation entre les mots et les nombres. Quantitative data are numerical expressions (numbers) while qualitative data are information expressed in words. Both words and numbers can help reduce poverty. Words produced, if properly used, can capture the feelings and imaginations of people to do something about poverty. Likewise, numbers produced, if meaningfully explained, can help understanding and mindset to affect poverty. They are complimentary. That is why when we try to reduce poverty, we need to choose and express ourselves in the right words. Likewise, when we use poverty numbers, we need to make them convey a specific poverty-relieving message and meaning. Poverty numbers do not speak by themselves. We need to make them speak with our explanation of poverty. So, both words and numbers produced and used can help reduce poverty. It is well known that statistical apparatus in developing countries (including those of Africa) is not well developed for both primary and secondary quantitative data. This is for various reasons, which include: the lack of financial resources and capacities, the high level of informal sector, the devastating effects of wars and armed conflicts on statistical infrastructures, the damaging impacts of natural disasters, poor governance, the lack of genuine census and democratically transparent process etc. All these make the numbers we need to end poverty difficult. There have been many projects across Africa for example to collect statistics and analyse them at national, local, pan-African, regional and multilateral levels. Some of these projects have been successful; others still need improvements. Using maths or numbers to help reduce poverty in Africa is also about using numbers to make donations happen, to convert a humanitarian appeal into reality (e.g. money donated). When asking or appealing to people to support good and deserving causes, numbers can motivate them. One can explain the needs in Africa and use other variety of means or tools (such as images, videos, voices recorded, words, stories etc. ); but when it comes to numbers they can convey a simple, sensible, collectable and accountable meaning to prospective and existing or continuing donors and funders. This is because some donors or funders are interested in words and stories; others in numbers and others more in both (words and numbers). Numbers make donations possible, simple (easy and straight forward to understand), sensible (perceptible to the pain poor people are suffering), fast (quick to collect and send), collectable (because donations are expressed in amount and currency) and accountable (explicable and responsible). Set up in February 2012 as the 2015-2030 Campaign, Halving Poverty is a CENFACS’ child protection and safeguarding advocacy work that brought together the aspects of the Millennium Development Goals (MDGs) related to children’s well-being – children global pledges – (as set up in the United Nations 2000 Paris declaration) and the Istanbul Programme of Action (resulting from the 2011 Istanbul declaration of the United Nations – Least Developed Countries IV Conference). It is indeed a linking and coordinating mobilisation project of action that uses two target deadlines of 2015 and 2020 (respectively from the Paris Declaration and the Istanbul Declaration) to advance the causes of children of Least Developed African Countries in seeking to expand the poverty reduction outcomes together with them. The project, which aims at improving child protection and safeguarding results, will empower beneficiaries against multi-dimensional poverty and hardship. As the MDGs reached their first deadline in September 2015 and transited to the 2030 Agenda and Global Goals for Sustainable Development by the United Nations, we therefore added a new target deadline to the Halving Poverty to reflect this transition, which was 2030. Despite this addition, the spirit and underlying principles about our campaign project remains the same as before, which are of Halving the NUMBERS of Children Living in Poverty. The 3 Bottom Thousands is a CENFACS project originated in 2013 from a statement and estimation that around 3 BOTTOM BILLIONS in the world are the Hardest Hit by poverty. 47.5% OF THE POOR IN SUB-SAHARAN AFRICA were amongst the WORLD’S 3 BOTTOM BILLIONS. The basic assumption of this project was/is that we can set up targets and objectives to reach out to and lift up some of them, let say 30 OF THEM. Then, as the years pass by we can MULTIPLY our support by 10 to relieve another 300, then afterwards we keep the momentum of 10 MULTIPLE until we reach our 3 BOTTOM 1,000 or Hardest Hit by poverty and hardships. As you multiply your support, you multiply saved lives as well. The above two experiences show that, it is possible to set up goals and targets in NUMBERS to help reduce poverty in Africa and elsewhere. As part of projects conceptualised by the idea of numbers, we would like to offer to the voluntary giving market and apply for support for The 3 Bottom Thousands. The 3 Bottom Thousands is a CENFACS poverty relief advocacy project based on holistic approach that seeks to help THE HARDEST HIT by poverty in Africa through a variety of ways, particularly in building their own capacities, capabilities and imaginations to escape from continuing poverty and hardships. The project uses the concept of numbers or quantity: 30 TIMES 10 EQUAL 300, 300 TIMES 10 and so on until we reach the NUMBERS goal target of 3 BOTTOM BILLIONS OF PEOPLE LIVING IN POVERTY. Details of this project can be requested from CENFACS. Like any initiative, this project requires funding. People can donate according to the amount they can afford and their wishes. To donate, just email, text and phone CENFACS. For more information about supporting CENFACS and projects, go to the page Support Us on this website. To reserve a copy or get more details about the 57th Issue of FACS, please contact CENFACS.